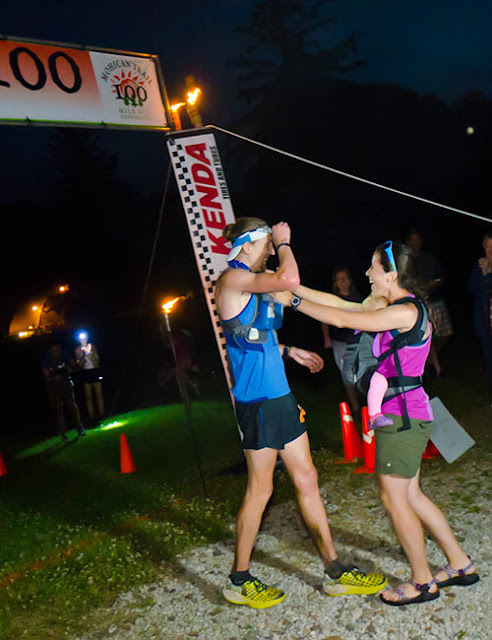 My last blog post was a race report from the 2016 Mohican 100 Mile Run - even though I've been absent from the blogosphere I've run another 100 mile race as well as a road marathon that I never found time, or set aside time, to write a race report. And here recently I completed the historic JFK 50 Mile Run for the first time. Before reporting on JFK I'll write a quick synopsis of what I've been doing since the Mohican 100. Last year after the Mohican 100 I knew it was a time for a break from running. I could sense my body breaking down and mentally I was beginning to loose the motivation and drive to compete. Even though I ran a great 2015 Mohican 100, winning and setting a course record, I told myself during the race that I was going to take an extended time off from running. So last year I didn't run a step in July, August, and much of September. This time off gave my body a chance to heel and recover from a lot of imbalances as well as give my mind some time off from the daily pressures I placed on myself to train at a high level. Luckily the time off allowed me to find the joy in running and I came back with a lot of motivation and perspective. Since last fall I've found a good balance with running. 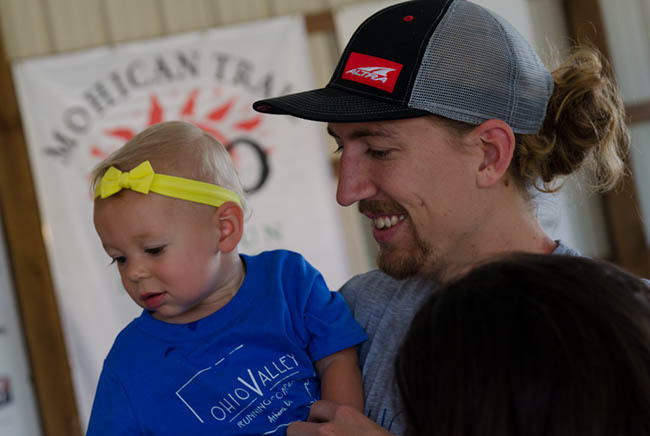 Even though I'm busier than ever with being a father, husband, working full-time managing Ohio Valley Running Company, and directing two spring trail races, my motivation and drive for running has been at an all-time high. A lot of this is attributed to the growing running community in Athens and SE Ohio. Having the support from OVRC, the runners that regularly come to group runs, and most importantly, the flexibility that my family gives me to train, has a huge impact on me. This growing community is what it's all about, and it really helps keep everything level while training and racing. Before the start of Cascade Crest getting a hug from baby Fern. Cascade stripped me to the core. I've tried to focus on getting out of my comfort zone a couple times a year with mountainous races on terrain that I'm not aptly able to train on in SE Ohio. The inability to train in the mountains shouldn't limit us in reaching epic places. 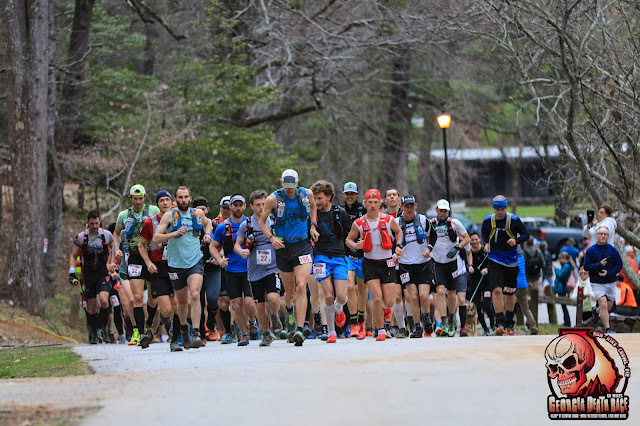 Having good races at the Grindstone 100, and two years at the Georgia Death Race at least showed me that I was able to hold my own in the mountains, but those races are in the Appalachia Mountains, terrain I'm much more used too. Cascade ended up being a new challenge. Things went great for 70 miles. I started conservatively at the beginning running much of the race with Hal Koerner and Gabe Wishnie. My main focus was easing into the course, adjusting to the big climbs as I moved on, and setting myself up for a strong finish. This worked out great, as I started around 15th place, moved into the top 10 near the Hyak AS at mile 54, and then after a long uphill to Kecheelus Ridge I bombed a downhill and averaged under 6:30 pace for 5 miles going into the Lake Kachess AS at mile 69. This strong 20 mile section moved me into 4 place and I was feeling good, especially since I was picking up my pacer Nick Koop. Unfortunately for Nick, we didn't do a lot of running after he started pacing. I traversed the "trail from hell" about as good as I could, still feeling fresh, running from one blowdown tree to the next on the ridge above Lake Kachess. I was still in 4th place at the Mineral Creek AS at mile 75, but it was the long gravel road climb to No Name Ridge that zapped me. The feeling came over me very quickly, and I began to regret the 6:30 miles coming off Kecheelus Ridge. The next 15 miles were a struggle, and it coincided with the hardest part of the course, "The Needles." This was the first time in an ultramarathon that I needed to lay down on the trail, and I did this several times. I would just tell Nick I needed a few minutes, turn my headlamp off, and lay down on the ground in order to regroup, only to bounce back up when I became too cold. Tired, weak, completely vulnerable on the mountain - this was everything an ultra does to you. I was passed by a lot of people, and there was nothing I could do about it. I walked, and paused, and continued walking, even on downhills through all of the needles. It wasn't until the sun started to rise, and a jolt of encouragement from a first-place Krissy Moehl at mile 95 that I was able to start running again. Fortunately I was able to finish the last 5 miles running, and finish strong, but I fell back to 12th place, with the winner being the course! 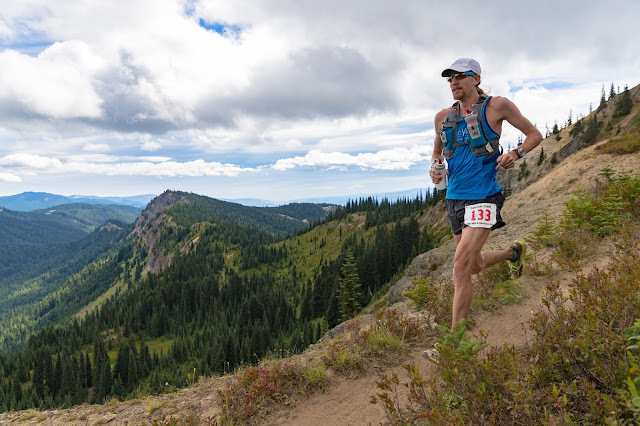 I'm super glad I ran Cascade Crest 100, and loved everything about the race - I came away with some great experiences and memories in the mountains! 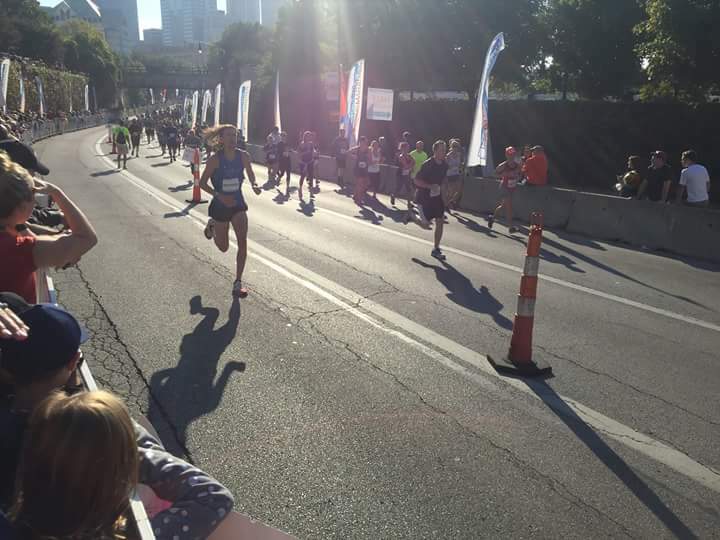 Coming into the finish at the Columbus Marathon. Photo by John Meadows. After the Cascade Crest 100 I had 7 weeks to recover and gear up for a faster cycle of training for the Columbus Marathon, and then another 5 weeks before the JFK 50 Mile. My legs surprisingly came back pretty quick after Cascade considering it was my second 100 mile in the summer. I jumped up in mileage quick and started throwing in faster workouts. One key workout 2 weeks before the marathon was a 20 mile run, with the first 10 at normal pace on hilly trails, and the second 10 on flat pavement where I started at 6:10 pace and inched by way down to the mid 5:30 and 5:40's before being able to close in 5:07 on the 20th mile. This workout, and a couple other similar race pace work gave me a lot of confidence going into Columbus. I had a mile by mile plan for the Columbus Marathon. I was running with former Shawnee State teammate Joe Stewart and we wanted to work together for as long as we could running faster splits throughout. Joe's goal was to get under 2:40:00 and so we set our first half-marathon to be at 1:19:20. This would put us ahead of his goal and also allow a faster time if we felt good. 6:00's felt really comfortable early on and soon we decided to start running in the 5:50's. We nailed our first 13.1 miles at exactly 1:19:20 like we had planned. Once we crossed over to the second half of the course we stayed together for another 5 miles and started to dip into the 5:40's. Joe dropped off a bit but I pushed on feeling great. Running a conservative first half really played a difference in being able to finish hard. In past marathons I ran aggressive at the beginning and always faded. This marathon was a complete opposite when it came to pacing. As the temperature warmed and we made our way into the last 10K of the course I began passing more and more top runners who were noticeably struggling. I continued to get faster and locked in on 5:30's pace the last 6 miles, and surprisingly moved into 8th place overall at the finish! 2:34:30 earned over a 4 minute negative split from the first half to second. The time didn't surprise me as much as being in the top 10 did. Being a ultra runner, and Columbus being just 7 weeks after my second 100 miler of the summer, I didn't think I'd be able to hang with the top road runners in Ohio. With this race being the key workout leading up to JFK, I gained a lot of confidence and started to reevaluate how I wanted to race it. 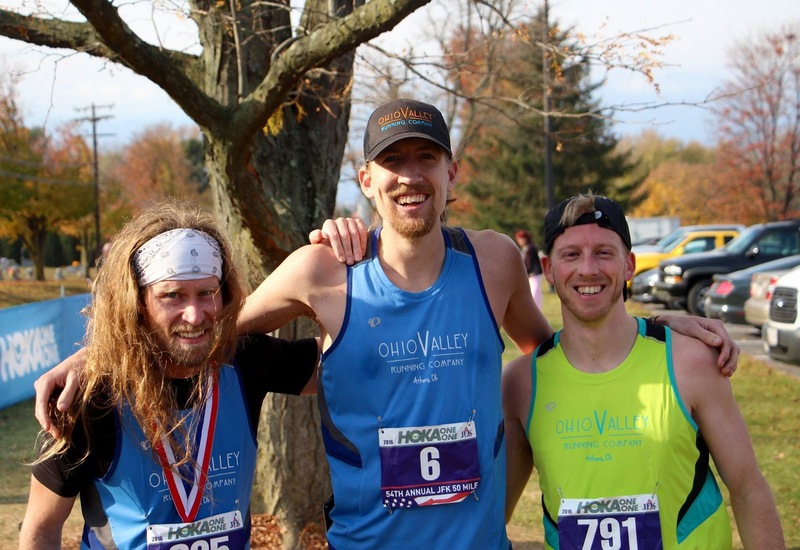 Shortly after the Team Ohio Valley Running Company finished JFK. Photo by Luke Kubacki. JFK is one of the "must-do" ultramarathons in the United States, with rich history and a big field of runners, it's a race that every ultra runner needs to put on their bucket list and experience. Being from the Eastern United States, and only a 4.5 hour drive, JFK has definitely been on my radar but due to other races and being later in the year the timing never worked out. After Cascade Robert Wayner and Mike Cooper, two local runners and training partners, and I started discussing signup up for JFK and making a trip out of it with our families. After taking a couple weeks easy post-100 in early September I had 10 weeks of training to prepare for a fast 50 miler. I knew I had the base to put some good work in before JFK but the biggest challenge would be switching gears from a slow mountain 100 to a flat and fast 50 miler. 10 weeks is a short time to turnaround and switch gears like this but I felt like after a couple easy post-Cascade weeks I was able to focus on some faster specific pace work. The Columbus Marathon 5 weeks before JFK was the perfect tune-up and workout to see where I was with running fast. As the race approached a few fast names emerged on the entrant list, including all the hype with Jim Walmsley going for the course record and adding to his stellar year. This would be a good one! Trusting pace and training is crucial in a race like JFK. 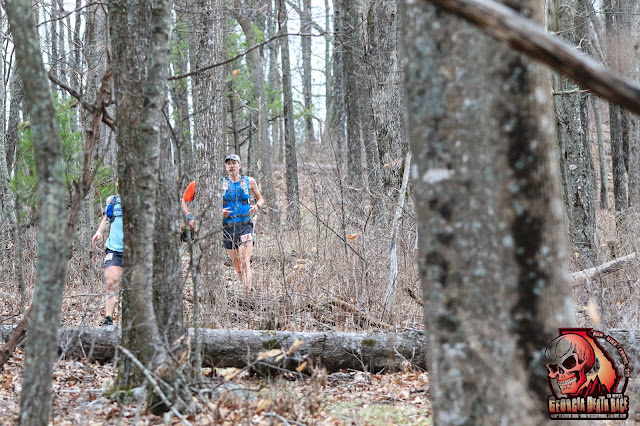 Unlike the varied terrain of most trail ultra's, especially in mountains, you can really plot out a race plan with pacing during the different sections of the JFK course. I poured over the results, splits from previous top runners that are provided on the JFK website, as well as past-runners' Strava splits. This started to paint a picture for what I wanted my plan to be on race-day. There were a few ways to go about running JFK. What to do, attack the first 16 mile trail section and hope you have the legs for the 26.2 miles on flat towpath, or conserve on the trail and then go at the towpath hard? One of the biggest things that helps was having a chance to preview the first 20 miles of the course with Mike and Robert. We drove over four weeks before the race and ran from the start in Boonsboro, MD to Harpers Ferry so we could preview the 16 mile trail section. This gave us a good idea of what the terrain, uphill, and downhill was like on the hardest part of the course. The trail section can be pretty rocky in some parts so it was really nice we didn't go into the race blindly. Riddle and Max both began the towpath around 1:45:00. Last year Walmsley was under 1:50:00 and I knew he would be going through faster this year. I didn't want anything to do with being that much under 2:00:00. When I previewed this section of the course, not running hard by any means, I entered the towpath around 2:15:00. I knew after that easy effort I could be around 2:00:00 without overtaxing myself so that was the goal. When the race started a large pack formed up front. Walmsley shot off much quicker and literally had 40 seconds on the entire race in the first mile and almost 2 minutes before entering the trail for the first time! He was flying. I focused on the rest of the guys and found myself in the back of a long singltrack line in the top 15. Once we hit the long uphill road section that took us to the highest point of the course I began to pass a few people here and there, and shortly after entering the Appalachian Trail again, I skirted by two more runners and moved into 2nd place. Being in second place this early was fine by me. I had a couple guys right behind me but I would rather be in front seeing the trail ahead of me than behind a few bodies blocking the technical sections. This position held the same for a long time until Anthony Kunkel ran by me as we started the downhill going into Weverton Cliffs at mile 13.5. This 2 mile downhill featured 1,000 feet of elevation loss and a lot of switchbacks, and would be the last such downhill, and dirt trail of the day. 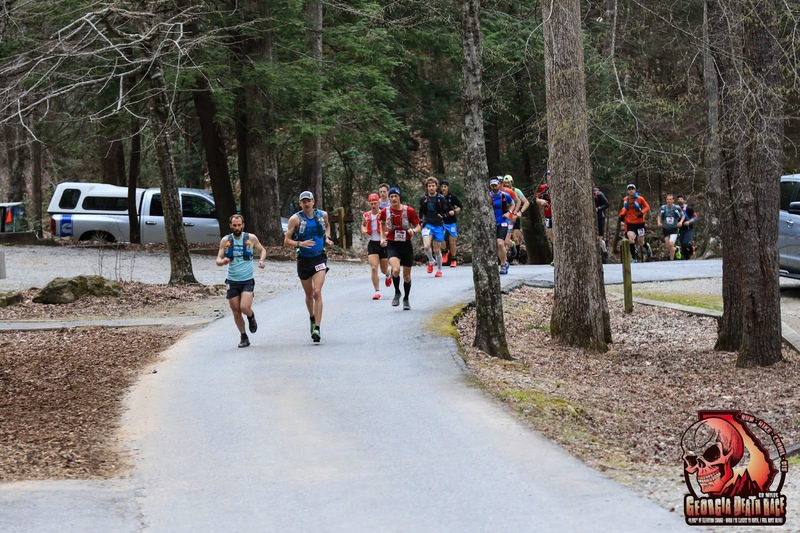 I went roaring through the 15.5 mile aid station at Weverton Cliffs, only a quick bottle swap from my crew, before letting the energy of the people surrounding this location carry me the last half mile down to the towpath. I was right on pace, arriving on the towpath in 1:59:50, 7:29 per mile pace. Running the Columbus Marathon five weeks before JFK makes this 26.2 mile section seem much more reasonable. Pacing is key on the towpath. There is 26 miles of controlled, level, smooth, crush gravel terrain ahead. Normally this may be a monotonous task, but having the Potomac River flanking the West side of the towpath, along with being in competition mode made this stretch easier. Anthony Kunkel was within eyesight when we entered the towpath, maybe 30-40 seconds ahead, and no one was within sight behind me. I knew I set myself up for a podium finish by hitting exactly what I had planned for the trail section. The plan on the towpath was to start conservative near 6:40 pace for the first 5 miles, then drop down to the mid 6:30's for the 5 miles after this. I thought if I maintained these paces early I could finish the last half of the towpath in the 6:15-6:20 range, running a similar way to the Columbus Marathon, except for about 30-40 seconds per mile slower. This plan would put me just under 2:50:00 for the 26.2 mile on the towpath, which I felt was super reasonable. Unfortunately I deviated from the plan soon after getting onto the towpath. The first couple of miles were spot on just under 6:40. Anthony was still in front of me and I was feeling really fresh. It wasn't long after this I started seeing 6:16, 6:15, 6:18, 6:17, 6:15 on the watch. I was 25 miles into the race and already jumped down to the mid-6:10's. This may be inexperience or stubbornness, or just being stupid, but I completely shot my race plan. At the time it seemed like the right thing to do. I told myself, "you have to take a risk to get bigger rewards" or "this feels easy, you'll easily be able to maintain this pace." Part of that little voice in my head is correct. Sometimes you have to compete, get out of the comfort zone to make something special happen. At the time I felt great, and I averaged 6:23 pace from miles 16-34, so if I were to finish that off I would have been 3 minutes under my goal of sub 2:50:00 on this stretch. Unfortunately I started to feel it near mile 35 and the pace became much harder to maintain. Having 15 miles to go felt good but I started to realize running 6:20 pace would not be happening anymore. During this stretch I was also bouncing back and forth into second and third with Anthony Kunkel. We were both feeling comfortable at those paces and it ended up being a good battle for a bit. We both started fading a bit after 35 miles, trying to keep it in the 6:40's but when I started to struggle a bit more in the last 3 miles of the towpath, into the low 7:00's, he pulled away from me and was out of site when we made the hard right-hand turn onto the paved county roads at mile 42. At the end of the towpath, even though I didn't hold it together like I hoped I would, I finished the 26.2 mile stretch in 2:54:00. an average pace of 6:38 per mile. Mile 38. Last crew stop, and I told them, "I'm starting to fall apart." The last 8 miles on gentle rolling county paved roads can be tricky. I knew about the initial climb up and out of the river valley from the towpath, but depending on how one felt, the last 8 miles could either go really well or really bad. 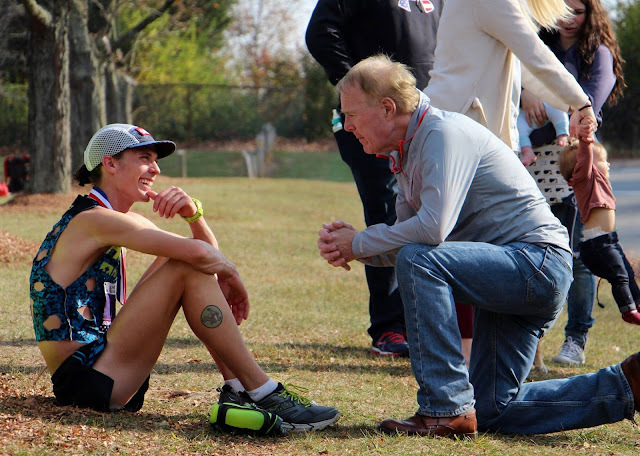 One person I looked at and wanted to mimic was Dave Riddle and his race splits from his "then" record-setting run in 2011. His first 16 miles were nothing special at 1:55:00, and his 26.2 miles on the towpath that year was 2:53:00, just one minute faster than mine. What he did great in 2011 was close the road section in about 53:00! This put him at 5:40:00, but very easily could have been 5:50:00 if he had run what most people run. For me, the wheels were already falling off before entering the road. Anthony had put a gap on me to where I couldn't see him, even on straights, but I kept pushing and thought I could still break an hour for the finishing stretch and I would have been happy with it. All 8 miles were a struggle. It's not that I was struggling running 7:30 pace - luckily stepping back into that zone was easy, but I wanted to push and it seemed like anytime I'd get down to 7:00 pace I would tighten up. I did what I could, looked over my shoulder a couple times, and even peered as far up the road as I could for Anthony showing any signs of weakness (or even Jim Walmsley ;). ), but he never came back to me. Fortunately a hard-charging Mike Wardian was just enough behind me that I didn't see him when I looked back. My road section time, which is about 8.4 miles. was 1:02:23, an average pace of 7:25 per mile. 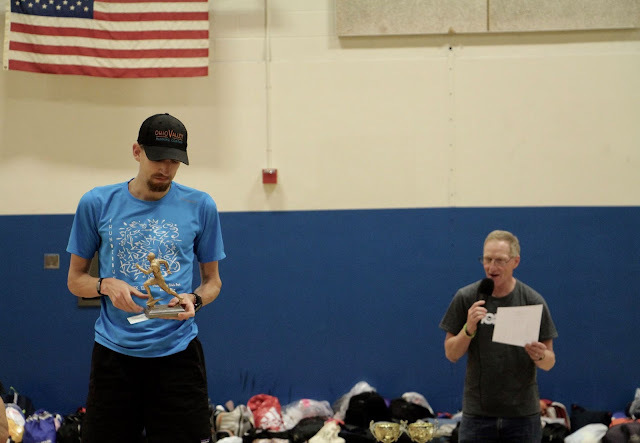 When it was all said and done I ran 5:56:01, good for third place 34 minutes behind new JFK record holder Jim Walmsley and four minutes behind Anthony Kunkel who ran a strong last 10 miles. Iron Mike Wardian came in just three minutes behind in fourth place. 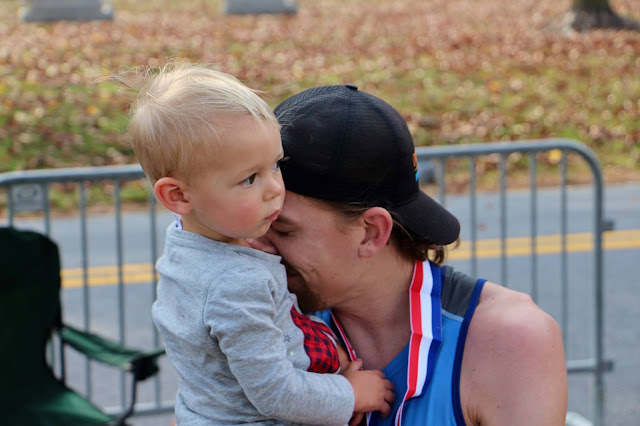 Just after finishing the JFK 50 Mile, embracing baby Fern! Photo by Luke Kubacki. 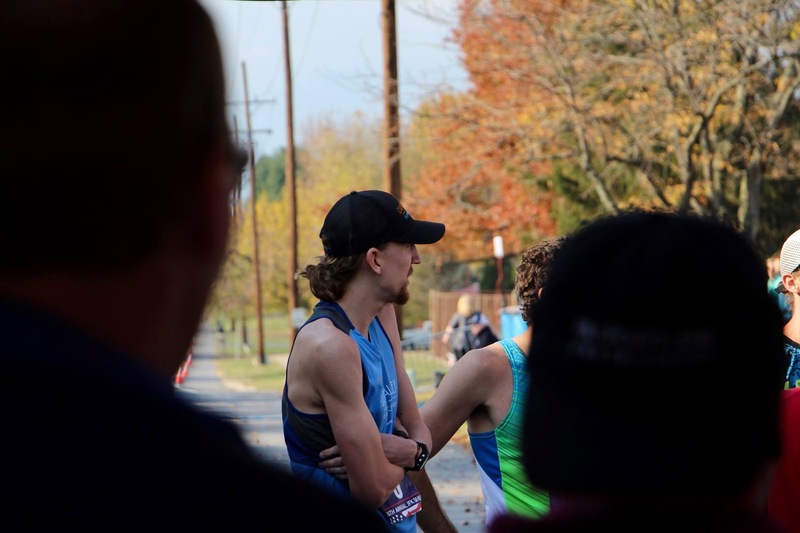 Looking back on the race I am honored to have joined the list of 33 runners who have broken 6 hours in the 54 year history of the JFK 50 Mile, as well as being the 22nd fastest runner in race history. Events that are draped in history, with stories and memories from the many years before, are really important to me, and to be able to be a part of that means a lot. 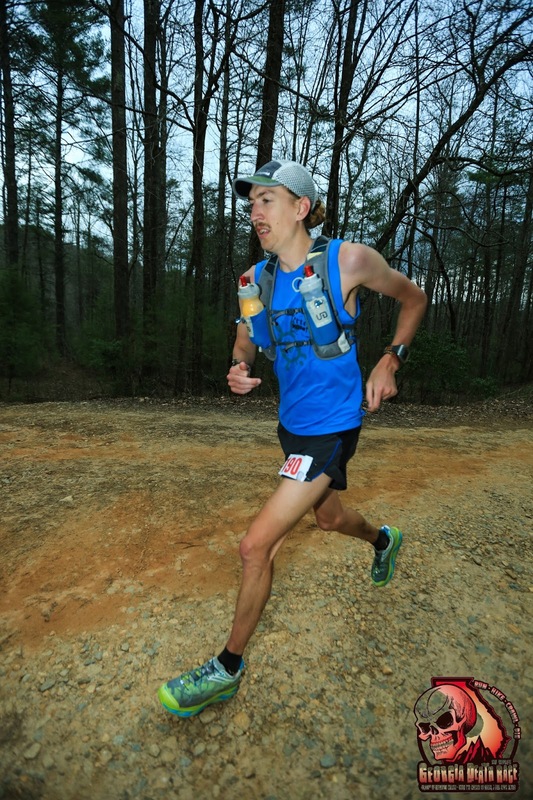 It was also really cool to be in the race that Jim Walmsley arguably ran the single-best American ultra race in history. It will take some time to see if his performance is held up as the best performance in ultra history, but I think it at least ranks up there as one of the best, and will add to his legendary 2016 year. Still, I can't help but think that I left 5-10 minutes out there. Who knows what would have happened if I stuck to my original pace plan on the towpath, but I would have liked to have found out if it meant I would have felt better during the last 8 miles. My thought is even if I would have ran the same exact time on the 26.2 mile towpath, but starting out slower and easing into a faster pace, I would have run onto the road with momentum instead of just holing on. Regardless, it makes me hungry for more at JFK and I really hope to be back soon! Top 10 men. Photo from Mike Wardian. I can't think my family enough for the support during training and at the race. Bobbi and Fern were troopers as I often came home after dark when I needed a couple hours after a 8-hour workday to get the mileage in. I averaged close to 100 miles/week in the 7 weeks leading up to JFK, so that's a 12-16 hour time commitment each week. My crew support was off the charts! Having Robert and Mike along for the trip meant having three crews at each stop! 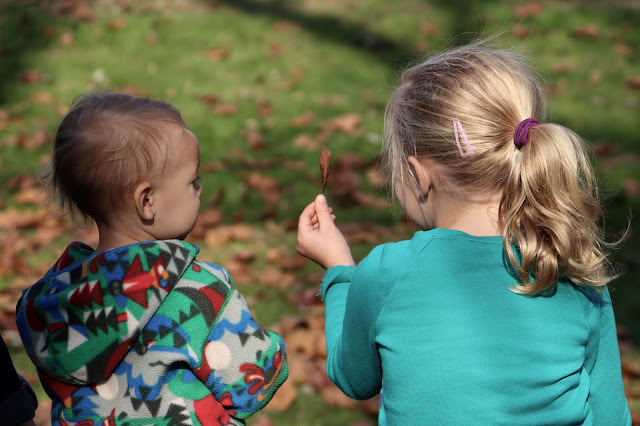 Fern had Robert and Ali's two kids to play with on the weekend, and Athens friend Luke Kubacki traveled with us for his first ultra crew experience and he was a huge help, including providing some great photographs that we'll be able to cherish forever. Thanks Luke! As always, my sister was along as part of the crew, and solidifying her role as an experienced ultra crew leader. Also a big congrats goes out to two good friends and OVRC runners Mike Cooper and Robert Wayner. Mike just started running about 3 years ago and progressed all the way to finishing 13th at JFK and sub 6:40. This was Robert's first ultra marathon and ran an incredible debut with a 17th place sub 6:50 finish! Team Ohio Valley Running Company was second place overall in the Male Team category, behind only a team assembled with Walmsley, Wardian, and Koerner -- but we were the first "real" team, with runners from the same city! Swiftwick socks have been with me for three years and on my feet for four years in every single ultramarathon I've run and probably almost every single run I've completed in that time. It's a brand and sock that I trust almost more than anything when it comes to my race day kit. UGo Bars, Julbo Singlasses, and Cocoa Elite are brands that have supported my ultra journey with quality products and gear. Their help is much appreciated - if you want to learn more about any of these companies, click their logo on the right side of this page. It's the Walmsley show, get in line! All photo's below by Luke Kubacki. On the podium with Race Director Mike Spinnler. 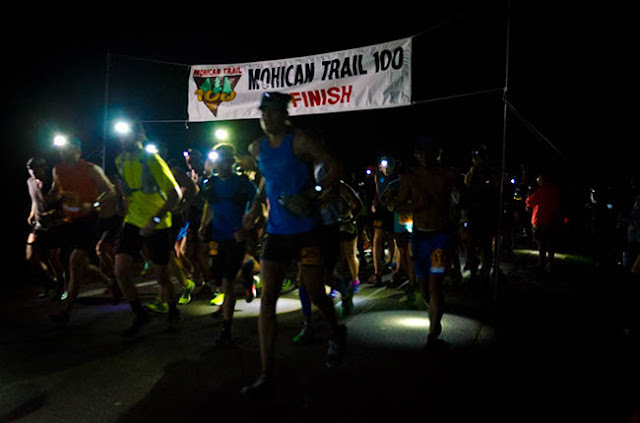 The Mohican 100 Mile Trail Run was my staple 100 mile race last summer and once I didn't gain entry into Western States 100 this year I set my sites on Mohican again. Having won the race last year I wanted to go back to see if I could defend my title and run a faster time. Last year the course was super muddy, so I wanted to see how different the course ran on a dry year, and as the race approached we had a long dry spell in Ohio so it was prime for fast trail running. 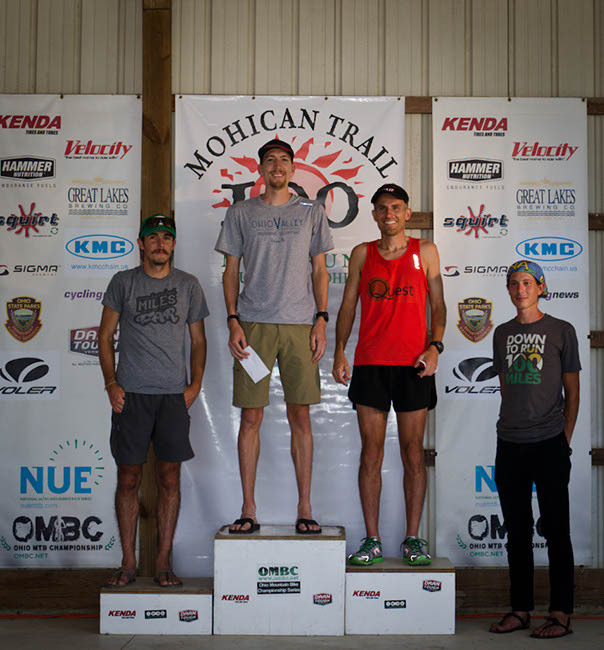 Mohican is a fairly low-key 100 miler (despite being one of the oldest ultras in North America), so I never felt like I had a target on my back or any pressure to perform. I knew the only way to run well again was by focusing on my own race and executing the plan and paces I laid out. The race started out in the Mohican Campground and a large pack of runners soon found the solace of the singletrack. Last year I immediately found myself in second place but this year I stepped back a bit and posited myself well behind a pack of leaders. One aspect I focused on were my splits from last year. Even though 2015 was such a muddy year I still managed to break the CR on the current course (altered in 2006 to have less road), so I knew what I was working with. Although there is always a chance that someone would run lights out and break away early in the race, I was pretty confident the race wouldn't start until the second half. We rolled into the first aid station at Gorge at the same time I ran that section last year, except this year there was at least 6 guys ahead of me. This was fine by me at this point - my goal was to tone it back some on the first lap becauase last year I was too fast and paid for it on the second lap. So the goal was to be steady the first lap and keep the second lap more consistent opposed to last years huge positive split. After spending a few minutes in the woods for a pit stop, I found myself just outside of the top ten twelve miles into the race. Soon though I began passing people and moved up into the top 4, and shortly after Covered Bridge (mile 15) I hooked up with Andrew Snope and Ron Wireman and at the next aid station I found out the person who we thought was leading the race must have stopped, or got lost, so we were now commanding the lead. At this point I was still in cruise control and was glad to see the time-split was 10 minutes slower than last year as Ron and I ran into Mohican CG aid station to complete our first 27.3 mile loop. Having a slower first lap, I was hoping, would set me up better for the rest of the day. I can't remember where I lost Ron but soon I was alone in first place, and at this time felt like I was rolling along pretty well. My times compared to last year were starting to get faster on the second loop, so I was executing just like I wanted to. Even though I felt like I was in the driver's seat, running down the dam at Pleasant Hill Harvey Lewis caught up to me. I had only realized Harvey was in the race at the starting line but definitely know how strong of a runner he could be. Harvey won the iconic Badwater 135 in 2014. That along with his list of other accomplishments had me on edge when he pulled up to me. I latched on to Harvey after this moment to finish out the second loop but from miles 45-54 I could get the sense that Harvey was feeling much better than me. The temperature had risen a lot since the morning miles and I erroneously failed to grab a second bottle from my crew at the previous aid station so I ran low on water for two long segments. I spent a lot of time in the Mohican CG aid station at mile 54.6 to make sure I was staying cool and hydrated. I was about 22 minutes faster to this point compared to the previous year, so my first two long laps were much more consistent this time, but I was feeling the heat, both from the weather and from Harvey. As I continued to take my time in the aid station, Harvey was quickly out with his pacer. There is almost always bound to be low moments in a 100 mile race - sometimes they last for 2 hours, other times they may be shorter low moments but more frequent - this was the moment for me. From near 52 miles, before completing loop 2, until mile 62 was the low moment that I have come to expect. I think keeping an in-the-moment perspective in low moments can really benefit when trying to rebound and come out of it to regain momentum. There is a tipping point - it's the moment in a race where you've committed to going for it, numbing the pain, when all discomfort morphs into your sanctuary. I walked the majority of miles 54.5-62. The section from Mohican CG to the Gorge Overlook was over 10 minutes slower than on the first two laps, and when I picked up my pacer, Robert Wayner, at mile 58, I was only briefly able to snap out of it before spiraling into a fit of walking. When I rolled into Fire Tower at 62 I was on fumes - I half jokingly told Bobbi that I was not having fun - but at this point I knew deep down that I had crested the tipping point. I was golden. I just needed to get up and start running again. Word at the aid station was that I was 12-15 minutes behind Harvey, meaning he put over 1:30 per mile on me in 8 miles. Before leaving the Fire Tower aid station I sat down and changed shoes. It was a short sit-down break, long enough to change shoes and drink and eat some more. When I got up, I headed into the woods with Robert to cut across the short loop and down to Covered Bridge. This section was mostly downhill so I decided to push it hard to see if I could get the wheels spinning. Luckily they came back to life, and in that section I regained the confidence to go for first place. Loop 3, falling behind, changing my shoes to try to break out of the funk. It was nice having Robert there to pace. 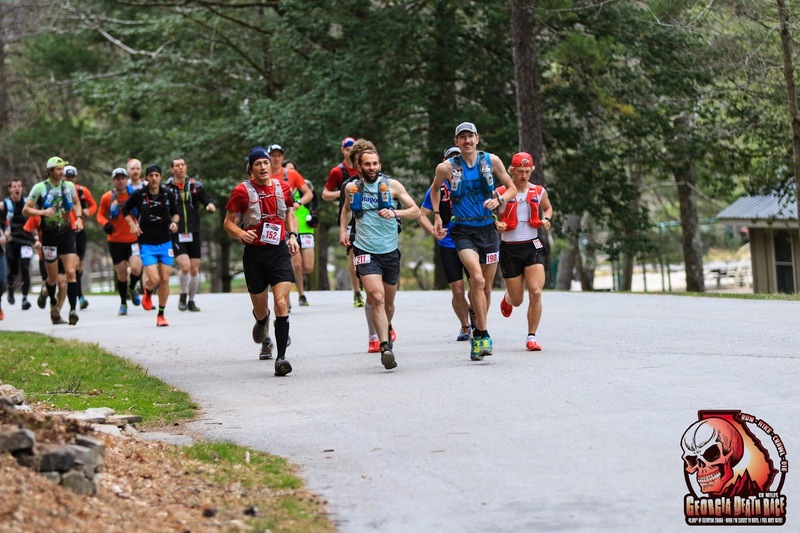 Just like last year with pacer Nick Reed, having someone to simply have small talk with helps eat away at the miles - before too long we had made it to the Hickory Ridge aid station at mile 71 and I was told I was still 10 minutes behind Harvey. Since I had only gained a couple minutes on Harvey in the previous 8 miles I relegated myself to continue pushing hard, but believing if I were to catch up to him, it would probably be late in the race. At that point I was feeling really good coming out of Hickory and began to drop the pace. I am not sure if I was moving along the trail really fast, or if Harvey was having a low patch in the next section but about 3 miles before the completion of loop 3 Robert and I were simply chatting as we ran along the trail and suddenly I spotted Harvey around a bend in the trail ahead. I was literally shocked. I was feeling good and hoping I was gaining, but I never imagined I would catch him so early, especially if the AS workers at the last stop were accurate about me being 10 minutes behind. My first reaction when spotting Harvey was to do what I did last year - sit and wait. This was almost déjà vu at this section of the race last year, where I finally caught Nate Polaske to move into first place. I spotted Nate at around mile 70 and eased up for several miles so I could wait for a good moment to move into first place, which wasn't until mile 77. When I saw Harvey it was around mile 74, and I started having flashbacks of last years battle with Nate. This time I knew I needed to capitalize on how I was feeling in the moment, so I whispered to Robert that I was going to go by Harvey, and do it with authority. I didn't need to change gears to get around Harvey, but a true testament to his grit is that he latched on and moved with Robert and I. This is when "racing" a 100 miler becomes "racing." At this point, 75 miles into the race, we were moving faster than we had all day. I started running harder and harder, pushing the short little rollers that I had walked on the previous lap as we came into the Mohican CG area. Harvey was hanging tough behind me and I had doubts that my race tactic was backfiring, and that I was going to bonk from this hard effort, but I had committed to breaking away from him so I continued pushing. After one more uphill and downhill push I glanced back and I couldn't see Harvey anymore. I was finally in first place alone but continued to push hard. The mile 77 split from my Strava data shows that my fastest mile of the day came at mile 77 for a 6:56, the mile that I broke away from Harvey. All business with Robert in the last lap. The last time my crew saw me I was over 10 minutes behind Harvey and sitting on the ground at the aid station looking pretty beat up - so when I came *sprinting* into the Mohican CG aid station at mile 78 in first place it must have been pretty exciting. Just like last year I came back from the low of loop 3 and regained strength before the fourth and final loop at Mohican. I was all business in the aid station and quickly grabbed what I needed. At this point, Robert, my crew, and I had our aid stations stops pretty well-oiled. Just before getting to the aid station tables I hand Robert my bottles and he would fill them with ice and water. In the meantime I grabbed several cups of soda and salty foods while my crew refilled my bandanna with ice and restock my gels and anything else I needed in my pack. This stop was less than 90 seconds; I wanted to get out and begin my last loop before Harvey came in. I was able to get out of the aid station before Harvey saw me. This was a competitive tactic that I hoped would put some doubt in him thinking that I had gained so much ground in a short period of time. I knew I still had work to do though, as anything could happen in the last 22 miles of a 100. Robert took a little break from pacing here so I had about 8 miles by myself before he would rejoin me to the finish - this was the same tactic I used last year, being confident to handle 8 miles alone at this point, and then joining a pacer again would give me another mental boost in the last 14 miles of the race. I ran virtually every step from Mohican to Gorge Overlook, had another fast and well-fueled aid station exchange, and again ran almost every step from Gorge to Fire Tower at mile 86. Feeling strong here was so uplifting, as the previous lap I struggled mightily. My thoughts here turned into running as much as I could, as I knew the more I ran meant I was either remaining the same or gaining on anyone behind me. The strength I had on the first 8 miles of the last lap was really encouraging as I hooked up with Robert again to begin the last 14 miles. There was a lot of positive self-talk going on between Robert and I so the mood remained light and relaxed; I was getting reports that I was over 15 minutes up on Harvey. The last 14 miles clicked by fairly quickly. At this time I was passing 100 milers on their 2nd or 3rd loops and it was great getting encouragement from them. I felt so in control of myself, mentally, physically, and nutritionally. When we had to flip the lights on around mile 95 I noted that last year the headlamps were needed around mile 88 - this meant I was much faster than my time from last year. When it got dark I was still pushing the pace pretty hard, but would cautiously slow down over some of the more technically segments. I tripped and stumbled once with a few miles to go but mainly felt comfortable maintaining a consistent running pace. Coming into the last mile on road is a great feeling. I remember the overwhelming sense of achievement last year in this finishing stretch. This time around it was more a sense of validation, as I came back to defend what I did last year, and a validation to myself that I could go faster. I swung around under the overpass to cross over to the finish area, and clocked in at 16:51:22, running over and hour better than my CR time from last year on the current Mohican course! I want to thank my crew, as they continue to get me through these ultras. Bobbi and Becca have become quite the tandem, with Baby Fern there as well providing inspiration. More of my family is able to come to Mohican and my mom and dad were at every aid station for help. Once again, I relied heavily on my pacer to help pull me out of low patches - Robert ran 38 miles with me at Mohican, his longest run ever! Now, he is thinking about doing a 50 miles - how awesome! The Mohican community is awesome and it's a privilege to be a small part of the long history of this race. I don't know if I will be back next year, but Mohican will always be a race that is a part of me. 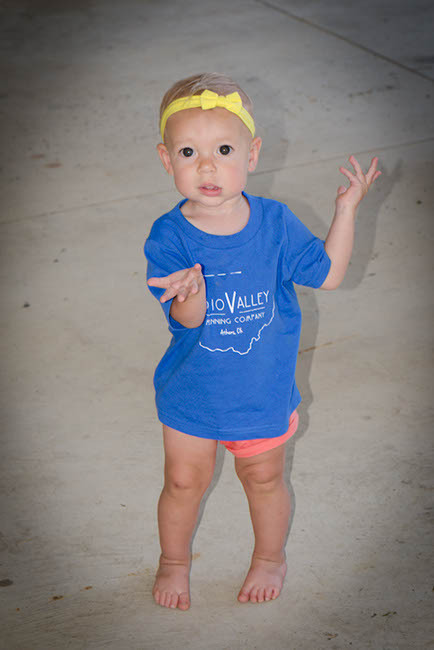 Finally, I need to give a huge shout out to the running community that is growing and thriving in Southeastern Ohio. 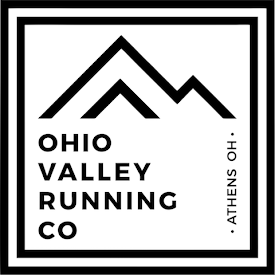 We have a good thing going in Athens, Ohio with community running group Team Run Athens and new specialty running store Ohio Valley Running Company. I represented OVRC on my singlet, as well as my great sponsors Swiftwick, Ugo Bars, and Cocoa Elite but it is the support of the people in the community that I think about and feel inspired by while running the race. Last year I ran the Georgia Death Race on a reversed course that made the race much easier. 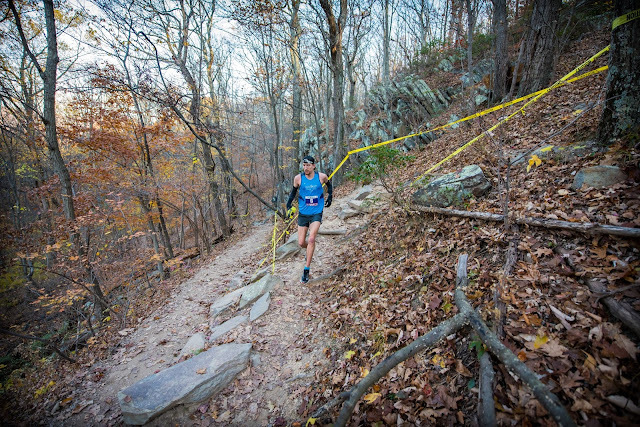 This year the course was switched to its original direction, plus an extra 5 miles of harder, technical trail was added near the end. In 2015 the young and quiet Andrew Miller slowly pulled away from me over the last 25 miles of the race; I still ran a solid race though in 10.5 hours. With the harder course this year everyone's time was much slower, and it took me nearly 2 hours and 40 minutes longer! The young kid though, still under 20 years old, didn't miss a beat and instead of letting me hang around for 40 miles, he blew the race right open 5 miles in. I never saw him again and he repeated as champion earning a Golden Ticket along the way. The race now, meant going after that coveted second and last Golden Ticket, which in my estimate, at least over a dozen guys were vying for, me being one of them. Second place stayed closer longer, but around 10 miles the less-than-one-year-old ultra runner, Caleb Denton, made the pack look slow on a steep North Georgia Mountain downhill. After Caleb left us, the East-coast veteran and UROY Top 10er Brian Rusieki, Hokie Ultra Runner Darren Thomas, and myself ran 3-5 for a long time. We chatted and had a good time catching up since we are all familiar with the east coast and Central Virginia ultra scene. I ran about 60 miles with Brian at the 2014 Grindstone 100 before he pulled away and beat me by 25 minutes, so I knew he was a very strong contender here. Still early, still with Brian and Darren. 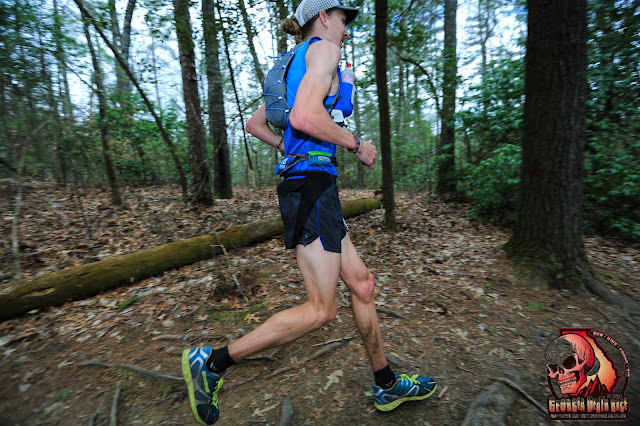 Photo by WeRunHuntsville. Running down into the Skeenah Gap AS (mile 21.5), the only out and back segment of the point-to-point course, we were able to see how far Andrew and Caleb were ahead of us. I estimated that we were 12 minutes from Andrew and 6 minutes from Caleb. While it sounds like a lot, 12 minutes was hardly anything to get overly worried about on a course like this one-third of the way through. I was still feeling super-chill and knew exactly what was in front of us. Last year the easy part of the course was at the beginning. This consisted of about 30 miles of gravel/dirt fire roads of long ascents and long descents; I thrived on it, cranking sub-7 miles. This year these sections were at the end of the race - my thought for race planning was to conserve energy and do some work on the fire roads in the last 30 miles of the course. I knew if I still had some legs no one in the race could out run me. As much as I pride myself on challenging, steep, technical mountain trails, the fact is that my raw speed is what I am best at in this point of my career. In the next section Darren stepped to the side of the trail to take a leak and I figured he would come back pretty soon but I never saw him again. I later learned that he messed up his achilles shortly after and had to drop at mile 47. Now it was just Brian and I for a long while. When I saw my crew for the first time at the Point Bravo AS (mile 28) I was still feeling fresh in 3-4 place with Brian. As we were leaving the aid station together we saw another runner come in who we had seen earlier on the out and back section. He looked good and had made up a lot of ground in the last 7 miles. Still running uphills at this point, but soon to hit it. Photo by WeRunHuntsville. Brian and I worked together in the next section but the new runner quickly caught up to us and passed. Brian was in front and didn't seem to want to go with him and I was still feeling good so I went with him on the quick downhill. I soon caught up and learned his name was Dominick Layfield from Park City, Utah. We chatted a bit and it was apparent that we were feeling about the same, running pretty quickly on the downs and flats and power-hiking most steep uphills. Progress reports were sparse on the top two runners so I was still happy with being in 3-4 place and still moving pretty steadily along the trail. It wasn't until Dominick pulled away from me a couple miles before the Long Creek AS (mile 41) that I hit a abrupt low point. Low points always come. Some more abrupt than others, some less low. This one that hit was bad. Like, things were going well and then I was going to drop out at the next aid station, if I ever reached it. I sat down for about 30 seconds when I arrived to Long Creek AS. I drank some ginger ale and mountain dew. I still had 7 miles to Winding Stair where my crew would be. The funny thing is that this is when the fire gravel/dirt roads started - the exact point of the race that I was looking forward to reaching so I could start to make up ground on the top 2! I guess the age old realization that nothing ever goes to plan in an ultra is the truth. baby Fern checking on me. An avocado was about the only thing that sounded okay. Me: "You need to really talk me out of dropping out right now." Bobbi: "You can't drop out, you're doing great, you're in 4th place!" Me: "I don't feel like it..... I'm tired of running." Bobbi: "Tomorrow you will regret it if you drop out." Me: "It doesn't matter. Why would it matter to me if I drop?... it's just a race." Bobbi: "Well you'll be a grump to be around and I don't want to drive all the way back to Ohio with you if you're going to be a grump." That was about the end of that conversation. I guess she convinced me because I started putting a new pair of shoes on and finishing my third mug of ginger ale. I stood up and meandered over to the aid station table. The ladies there were great, but I still couldn't eat anything, just drink sugar. All in all I took 11 minutes at Winding Stair before finally moving on. I hugged Bobbi and Fern and started running. No real chance to drop out now. After leaving Winding Stair AS there was a steep 3 mile down hill that I knew was coming - I decided to push hard on this section in attempts to wake my legs up and start rolling. This amazingly produced 6:33, 6:22, and 6:59 miles from 48-50. Unfortunately this didn't last forever but I was at least making relentless forward progress. Out of Jake Bull AS (mile 53) I relished a couple miles of faster road miles before starting the long climb up Nimblewell Gap. I remember this section from last year when it was still early in the race going the opposite direction downhill; I ran 4 consecutive 6:30's miles. This year it literally took over twice the amount of time going uphill as I struggled to maintain 15 minute hiking pace. I probably only managed to squeak out 3/4 a mile of running over the 4 mile hill. It dragged on and on until I watched the sun start to fade. One of the only good things about taking much longer than planned for this years GDR was seeing the sun set over the distant mountains - it was beautiful. The rugged North Georgia Mountains are no-joke. They test your will, your mental and physical abilities. I always feel better for going through it. Whether it takes 10.5 hours to traverse through the mountains, or 13 hours to cover the same ground, I always feel better. Being up on the ridge as the sun set, I was content. The race didn't end like I hoped, but I had 7 miles to finish and knew I was okay. I was just in the mountains doing what I love to do - I set out on these journey's knowing exactly what could happen, and what likely would happen. It feels really good to be able to do that, no matter what the outcome is. 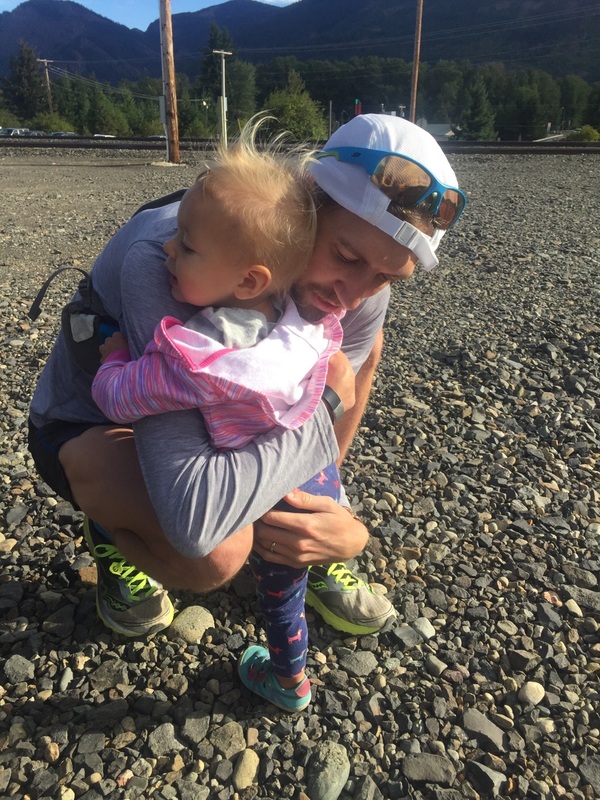 I wasn't going to Western States, not this year, but it didn't really matter - I had a beautiful daughter and a wife that convinces me to do the right thing when things get rough waiting for me at the finish line. And on that note the sun dipped below the horizon a final time, I turned to face downhill, flicked on my headlamp, and started to run. Always relaxing at the beginning to catch up but soon turned to all-business. 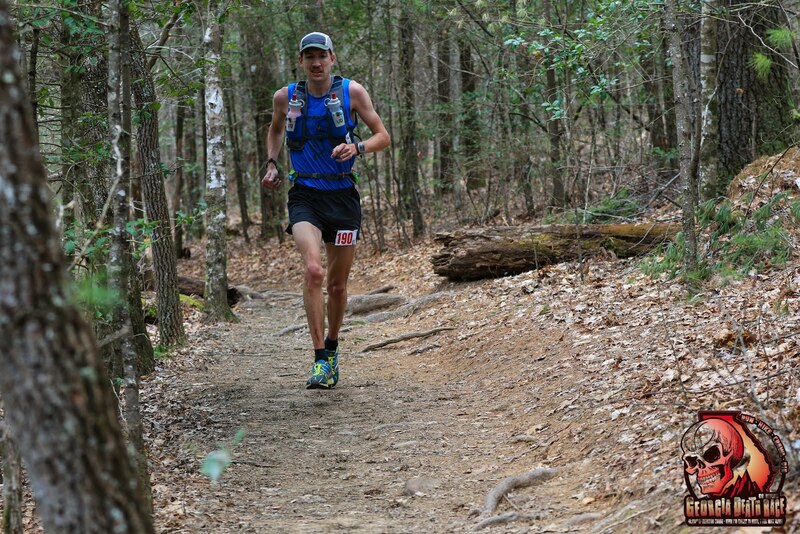 Photo by WeRunHuntsville. Trying to grind 60 miles in. Photo by WeRunHuntsville. With the Olympic Marathon Trials happening a couple Saturdays ago I couldn't help but dream about what a 100 Mile Trail Race would look like as an Olympic sport, and subsequently having a U.S. Olympic 100 Mile Trials event that selected the 3 males and females to represent America at the Olympics. This idea will probably never happen in our lifetime, but it is fun to think about what a 100 mile event would look like at the Olympics. I just don't think there is enough countries represented in ultra marathon and 100 mile distances to warrant it as an Olympic sport. The sport is growing however, so who knows, maybe an ultra marathon at the Olympics will happen someday. I also remember in 2011 when Geoff Roes started a discussion about "The Championship Race." It is kind of funny going back and reading his post and the comments on it, as ultra running has grown so much and taken on new structures and ideals in the past 5 years. 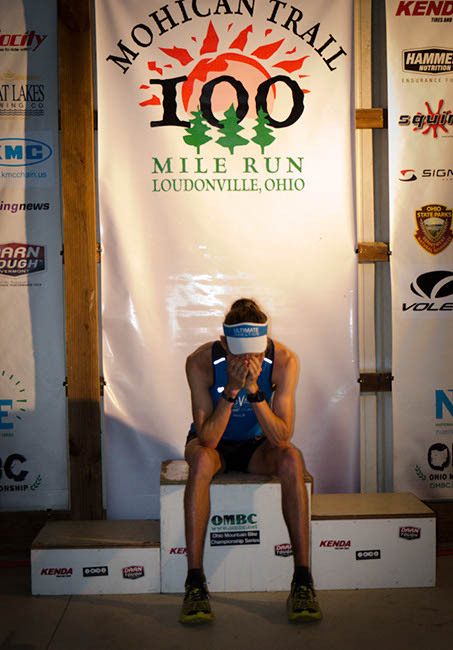 But as Geoff called for in 2011, "a true championship race in American Ultrarunning," we have still not seen it. Races such as the Ultra Race of Champions (UROC) and Run Rabbit Run 100 have started since then offering higher prize money and attempting to attract "championship" caliber fields, and while organizations such as the US Skyrunner Series and USATF Championship Races create a "championship" feel at their races, there is still no "true championship" race in American Ultrarunning. 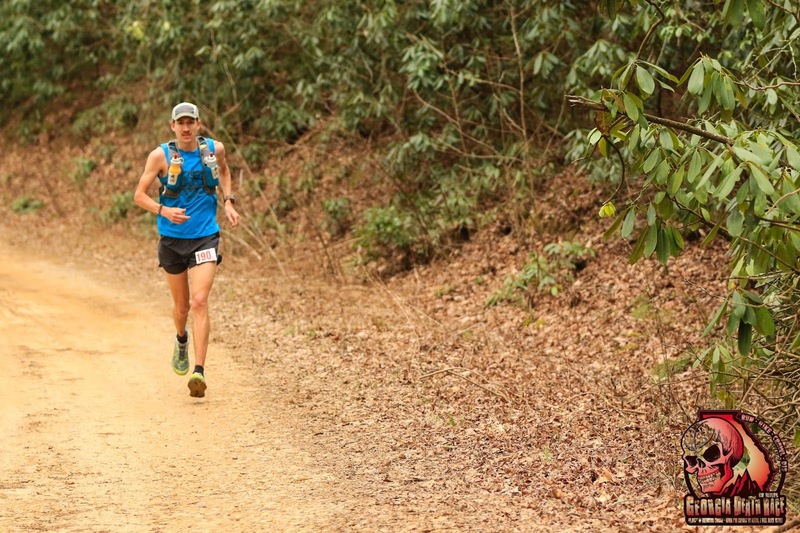 In my opinion, traditional ultramarathons like Western States 100, Lake Sonoma 50, and The North Face 50 Mile EC have all been the most competitive fields for American Ultrarunners. This article and graph from UltraRunning even confirms what the most competitive races were in 2015. UltraRunnings findings for most competitive races in 2015. The fact is that there is no one race per year (or every four years like the Marathon Trials) where ALL of the top ultra runners in America show up to compete for something worthwhile. I am not saying we need to have this type of event. 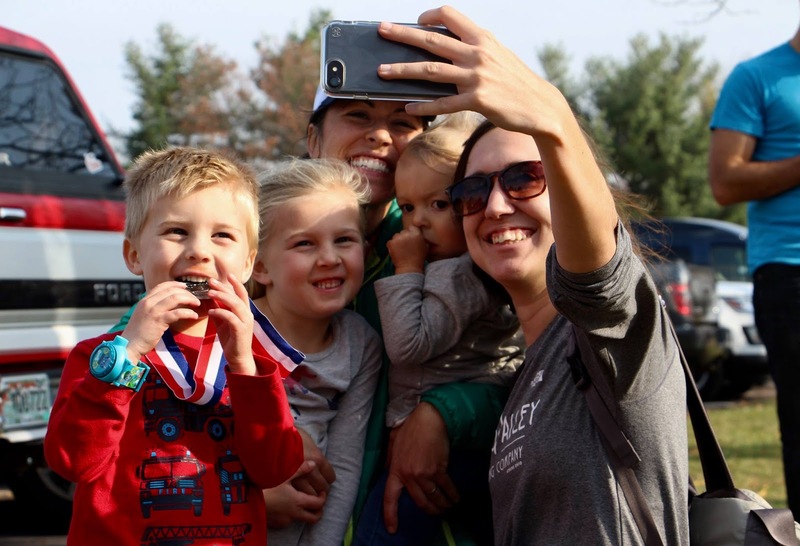 The argument of whether an elite race like this is good or bad for our sport has long been overplayed in past discussions, but for the sake of imagining a bid for running in the Olympics in a 100 Mile Trail Race, we need to have such a race. Most individual sports (golf, tennis, running, etc.) have events where ALL of the top athletes in that sport are competing. Golf and tennis have the four majors, running has the major marathons and Olympics every four years. In ultra running, when was the last time all of the top 10 vote-getters for Ultra Runner of the Year raced in the same event? I'd venture to say never! It is probably rare to even have more than 3-4 of the top 10 vote-getters at the same race, except for maybe one or two of the races from the chart above. If the Olympics had a 100 Mile Trail Race event, then ALL of the top American Ultrarunners would toe the line in the same race at the same time every 4 years at the U.S. Olympic 100 Mile Trials. This is exactly the case of the U.S. Olympic Marathon Trials. Throughout the 4 years between marathon trials events, each major marathon sees a dozen or more elite American men and women per race, but it isn't until the Olympic Marathon Trials that ALL of the top American men and women compete against each other. If there was a 100 mile race with the same incentive of making the Olympic team, I would argue that we would see the same thing every 4 years in ultra running. Could you imagine!? The Marathon Trials has a simple method of time standards for runners to achieve in order to qualify for the Olympic Trials. 100 Mile Ultra Trail Races cannot use this method because of the variability in terrain at different races. So, there needs to be some sort of method to select the runners who would compete in the U.S. Olympic 100 Mile Trials. This method would need to be worked out, but it may be based on wins and placement in selected races, your ranking by one of the established ranking systems, or application/resume based. I think placement at a selected list of races over the course of 2-3 years would fill the team well (like top 10 of certain races qualify, etc.). Having one race on one day to select the top 3 males and females to represent America makes for such a compelling story. 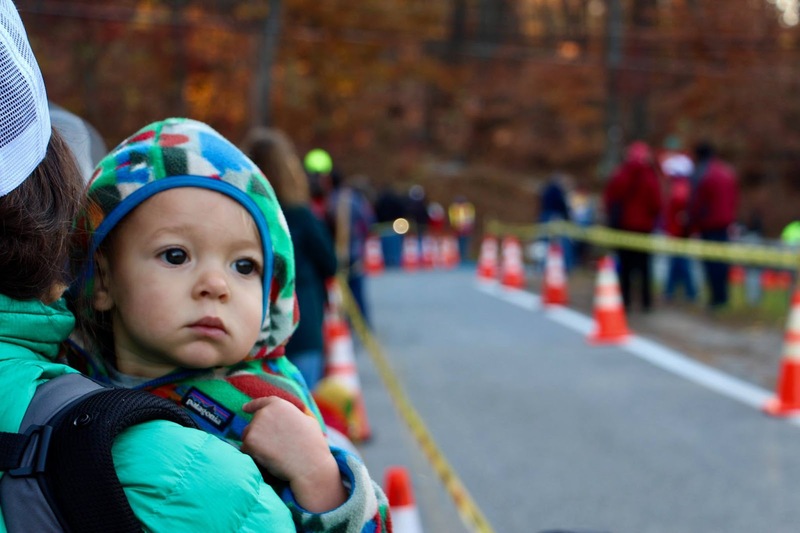 Even ultrarunners were watching the marathon trials a couple weeks ago! This makes for a dramatic way to select a team, but really, it is the fairest, least-ambiguous way to send a team to the Olympics. The U.S. Olympic 100 Mile Trials would need to have the same selection method in order to get ALL the top ultra runners in one race. Sure, some runners would be injured and some would have a bad day, but that all adds to the drama of a "championship." Just like in the marathon, the 100 Mile Trials would need to take place every four years. If the Olympics are in the summer of 2020 per-se, then the 100 Mile Trials would need to fall sometime before that date giving qualifiers plenty of time to recover and train for the Olympics. The Marathon Trials are in January so I would guess 100 milers would need even more time to recover, plan, and train for the Olympics. Maybe a date in September or October of the year before the Olympics is when this 100 Mile Trials should be. The location of the U.S. Olympic 100 Mile Trials would need to alternate every four years. It could either be bid on from current events like how the Marathon Trials is or Local Organizing Committee's (LOC's) could form to create an entirely new race every four years. This might be the best option since the 100 Mile Trials course would need to mimic the Olympics location. For instance, the 2020 Summer Olympics are in Tokyo so the U.S. Olympic 100 Mile Trials would need to be similar to the 100 Mile Course in Japan, which would already be plotted out by the actual Olympic Organizing Committee. The terrain, elevation, etc. would all need to as closely as possible match the Olympic site. This is all assuming a typical trail 100 mile, with singletrack trail, runnable terrain, and variable elevation changes. This 100 mile race would not be on a road or track. 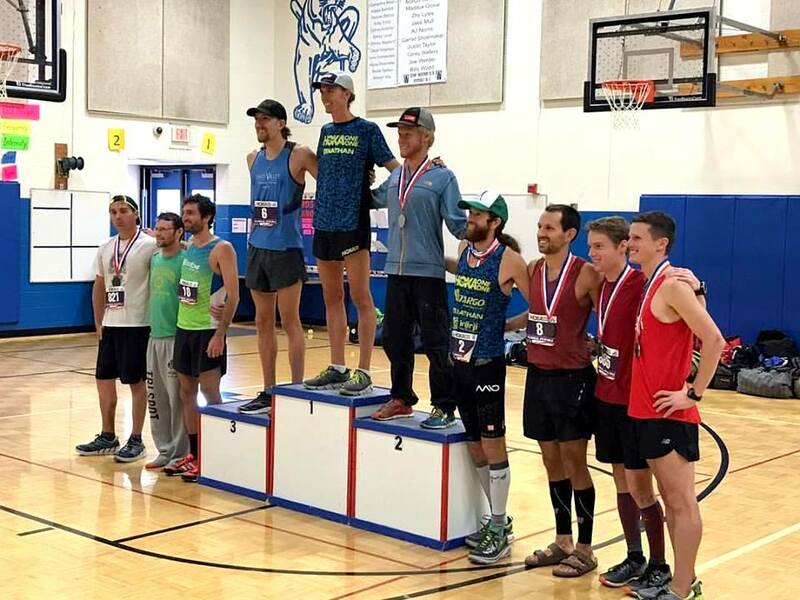 Imagine an all-star line-up of reputable race directors getting together to plan and put a bid in for a U.S. Olympic 100 Mile Trials hosting right. There may for 2-4 LOC's from different regions of the country making a compelling case to hold the 100 Mile Trials at their location. This competitive bidding process would bring out the best course, planning, and logistics and ultimately be the best operated 100 mile around. Ultra running is know for its community and ability to put the most elite men and women in the exact same race as those runners not competing for top places. This is one aspect of the sport that needs to remain in tact even if a U.S. Olympic 100 Mile Trials takes place. To do this, it could be structured just as the Marathon Trials are, by having the elite race on one day and the "pedestrian" race on the day after. This structure would encourage more spectators at the 100 Mile Trials and then allow those spectators to run the exact same course the next day. I think this would really keep in line with the community and spirit of the sport. This is a fun dream, isn't it? Who wouldn't want to see Rob Krar, Timothy Olsen, David Laney, Sage Canaday, Dakota Jones, Seth Swansen, Dylan Bowman, Jeff Browning, Ian Sharman, Jason Schlarb Hal Koerner, Mike Wolfe, Alex Varner, Zach Miller, Max King, Jorge Maravilla, Mike Wardian, Scott Jurek, Anton Krupicka, Mike Foote, Nick Clark, Yassine Diboun and the 100 or more top American men as well as Madga Boulet, Stephanie Howe, Rory Bosio, Kaci Lickteig, Larissa Dannis, Krissy Moehl, Nikki Kimball, Michell Yates, Darcy Piceu, Aliza Lapierre, Cassie Scallon, Denise Bourassa,Sally Mcrae, Meghan Abogast, Pam Smith, Caroline Boller, Jodee Moore, Joelle Vaught, Amy Sproston, Pam Reed and the 100 or more top American women ALL compete in the same race!? Coming into the year I was really interested in a few of the early Western States Golden Ticket races. I was originally registered for the Bandera 100K in January but I came down with a 3 day flu that put me out for a few days the week of the race; so I quickly changed plans and entered the Black Canyon 100K hosted by Aravaipa Running in Arizona. This would be a great option to go for a "Golden Ticket" and an opportunity to race in a desert environment which I had never done. Plus, Aravaipa Running and Jamil Coury put on quality events on great courses. I was excited to race for the first time in 8 months as well! Leading up to the race there were some great names dotting the registration list. A legend like Hal Koerner, former UROY Sage Canaday, fast road marathoners like Chris Mocko, and other recent top trail runners like Ryan Kaiser, Paul Giblin, and about a dozen other names I wasn't as familiar with. It was shaping up to be a hot race, not just with fast runners, but literally hot temperatures in the Arizona winter. I was keeping an eye on the weather forecasts and about two weeks before the race Phoenix only saw highs in the 50's for several days but as the race approached the forecasted temperature kept rising. Race day temperatures called for high-80's - only about 80 degrees higher than the single-digit temperatures I came from in Ohio. The course is known for being a tale of two halves. The race starts in Mayer, AZ at an elevation of 4000' but runs mostly downhill to around 2000' in the first 50K. The second 50K then provides many little up and downs with a couple longer climbs. This makes the first half of the race fast, and the second half much harder. I had a pretty good grasp on last years winning splits and didn't want to go much faster, or faster at all, then their times as many of last years runners faded hard in the last half. My goal was to hopefully conserve for a stronger second half and hope a fast pace gets the front runners like the previous year. The grind starts in the second 50K. With someone like Sage Canaday in the race I feel like everyone sort of lets him dictate the early pace. Once we started though I could tell there were a few others who wanted to push the early miles. I settled into a pace that was still faster than last years winners miles but still nowhere near the front pack. As Hal Koerner posted on social media later that day, this was a road 100K pace! The winner of last years race, Ford Smith, went through the first 50K in about 3:50:00 so I was a bit taken aback when I was at 3:45:00 through 50K and in about 9-10th place! The front group of Sage and others ended up already being about 10 minutes ahead and we were all on an alarming course record pace. Below is a comparison of my first 50K mile splits compared to last years winners first 50K mile splits. I continued running well until about mile 34. Charlie Ware and we had been running much of the race together but he slowly pulled away from me on a rocky and technical downhill at around this point. Running into the short out and back section to the Black City Canyon Aid Station (mile 38), I saw that Charlie had already gaped me by about 6-7 minutes! By this time, the temperature was already reaching 80+ and people were starting to feel those early fast downhill miles. I came into the aid station in around 8th place after learning a couple guy had dropped out and after passing a runner shortly out of the aid station, I settled into 7th place. I was feeling it by this point however. But the interesting thing is, I think everyone else was feeling it just as much as I was. The more I struggled for the next miles, the more I kept thinking someone, or many, were going to start passing me. I was walking on the uphills, even walking easy flat trail. I wish I could go back and get in the straight mindset during these miles but this is the challenge of ultras - some people have this innate or learned ability to be super present with themselves and be able to push through rough moments. My best races I have been able to do this. My legs were feeling pretty good, I was staying well hydrated, but the sun was frying my brain and making it hard to think clearly. I just wanted to be done. I knew I was not going to be done however for several more hours. Eventually I got a hold of myself. Running in the desert the day before the race! While the last 12 miles were anything but fast (just compare my splits to Sage's), I was at least feeling good and running most of the way. Nothing special happened. No one tried to pass me or I didn't see anyone in front of me. I just got to mile 50 and started to sense the feeling of being finished. I had been running since mile 38 without seeing another runner - still in 7th place. I didn't know how close anyone was in front but was also pretty confident that if I just kept running, and since no one passed me during my slow 18 mile stretch, that I would make it to the finish no worse than 7th. That is what happened. As I ran into the last 2.5 mile section (the only part of the course that I ran on the day prior) I was feeling good and even able to run a few sub-8 miles! The Western States Golden Ticket was out of the picture, but I was finishing a grueling race in an unfamiliar environment. I stayed in 7th place overall behind 6 super-tough guys, and finished in around 9:17:06. The desert was a tough place, and far from the single-digit temperatures that I was training in during Ohio's winter. I hate to use the high temperatures as an excuse but I won't lie and say it didn't affect me. All in all though, I think I handled the hydration part pretty well. I wonder how some of the locals handled it. 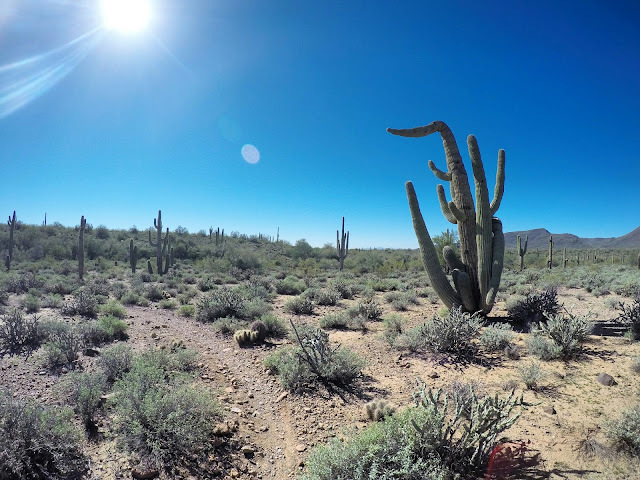 The desert was also much different than most Eastern Ultras that are lush forests with shaded trails and green vegetation all over. Besides the tall slender cactus and sparse juniper, there wasn't much growth above my head to provide shade. These open and exposed vistas are certainly alluring in its own way however. But there was a sense of loneliness in the desert during the final 26 miles when I didn't see any other runner. The early pace was fast! I knew it would be this way - and there is probably no getting around having a much slower second 50K than first, but my splits were alarmingly opposite. Charlie Ware, who didn't pass me until around mile 34 ended up getting second place - his strong second half of the race was still much slower than our first half, but he executed the smart race that I had hoped to and battled tough during those hot and hilly middle miles. 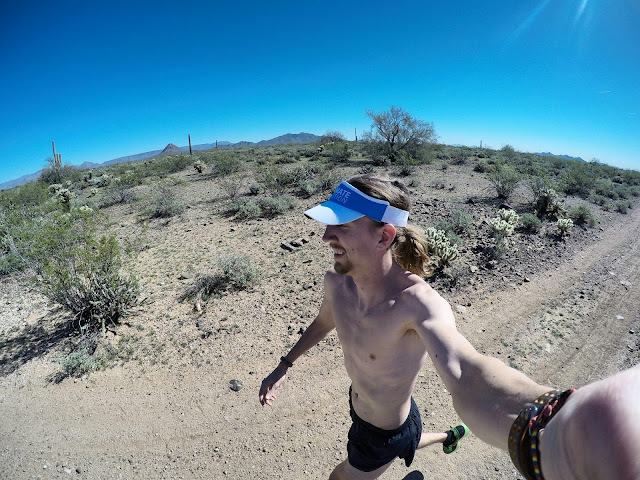 And Sage Canaday was just on a different playing field winning the race by almost 50 minutes and setting the Black Canyon 100K course record by over 40 minutes! Huge congrats to those two as they now make their way to Western States 100! Anyone who managed to stay strong and finish on this grueling day deserves mad props! Some sections of the Black Canyon Trail were rocky like this! I really appreciate all the support from back home and the friends and family that follow my ultra running adventures. This was the longest I'd been away from home without baby Fern so it was tough not seeing her or Bobbi for 5 days. They are constant sources of motivation in race. I had a good time hanging out with Virginia/Ohio compadre Rudy Rutemiller and meeting his friend Dylan from Flagstaff. We all stayed in a hotel together along with Ezra Becker from the Bay Area. Rudy, Ezra, and I all finished the race which was a nice accomplishment and Dylan crewed and paced with Rudy the last 12 miles. Their Bay Area running community vibe is infectious and something I look forward to seeing more of in SE Ohio! This was a super well organized and directed race by Aravaipa Running and Jamil Coury and his crew. I've been wanting to run one of their races for a long time. The trail running community really shows at the aid stations and post-race festivities. Some of the best aid stations I've experienced! With the hotter than expected temperatures they were on top of getting water and ice to runners, and did great getting my bandanna filled with ice at each station. Amazing organization and I'd recommend their races to anyone. And thanks to my sponsors UGo Bars, Swiftwick Socks, SOS! Rehydrate, Julbo and Honey Stinger for supplying products and support that directly help me get through a race like this and the training leading up and recovery after. Having these brands along make the preparation much easier and allows me to just focus on giving it my best during the race! I am currently registered for the Georgia Death Race 68 Mile on March 19, which is another Western States Golden Ticket race. A big part of me wants to stop holding Western States up so high as a goal and just go off and run other races and wait for the lottery to get in, but the allure of participating in the most historic 100 miler has me pulled in. So I will be toeing the line in Georgia looking for a top 2 finish - a race that I finished 2nd in last year when it was not a Golden Ticket race! I will try to repeat and build on a strong race from last year. I was also selected in the Cascade Crest 100 Mile that will be August 27. I really look forward to seeing this course and region. The Cascade Crest course seems to be my type of course!